I had a student this year who had a difficult time beginning and completing his or her classwork. Often times this student would refuse to do the work or begin the assignment with the rest of the class. This sheet helped keep track of this behavior in the areas that he or she needed it most. It was also being brought home so that the parents were seeing it. 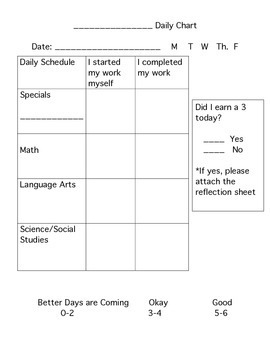 Using the chart, the teacher and/or parents could put into place consequences or even some kind of reward system.